This is a rich chocolate pudding my grandmother makes. Creamy chocolate pudding tastes so good, you can eat this while it is still warm or serve it with a little whipped cream. You really don’t need to buy the stuff in the box when you can make this delicious chocolate pudding. Source: Virginia McDowell. Jefferson City, Mo. 1963. This chocolate pudding cake is moist and so rich. Sift flour, sugar, baking powder, cocoa, and salt together. Stir in milk, vanilla, shortening and nuts. Pour into greased 8x8x2" pan. Mix brown sugar and 2 tablespoons cocoa. Sprinkle over batter, and then pour hot water over all. Bake in 350 degrees oven for 35 minutes. Serve warm with whipped cream. Stephanie, this looks so good. 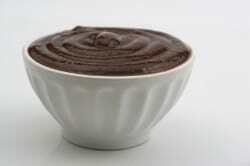 I don’t have a staple chocolate pudding go to recipe, and this will be it. Love recipes that are handed down. (That means we know they’re good!) Hope you’re having an awesome summer! This was really creamy I used Dark Chocolate cocoa for an extra special treat!